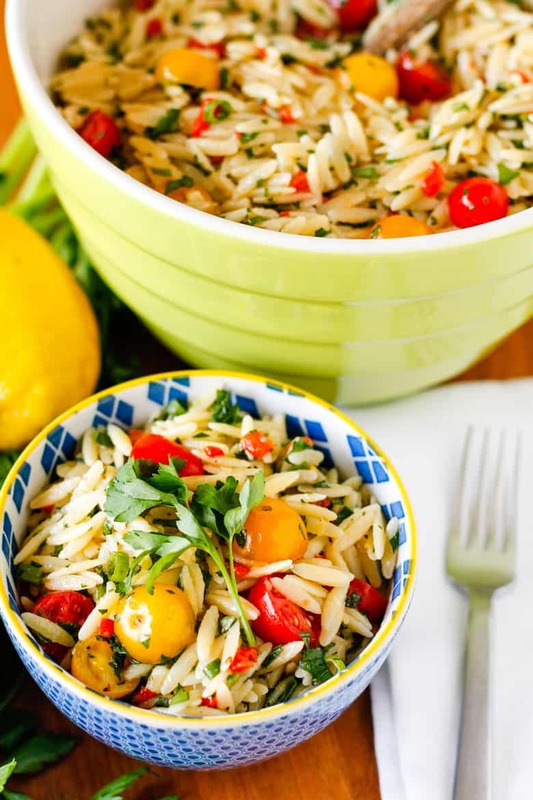 This healthy orzo salad recipe is FULL of bright, fresh, summery flavor… Gorgeous red and yellow cherry tomatoes, bright parsley, and vibrant basil, along with a dose of fresh lemon zest and juice marry together to make the perfect side dish to share at your next gathering! 1| It makes a BIG batch, which is perfect for a crowd. But if you’re not feeding a crowd? It refrigerates well for several days. And trust me, you will have NO problem finishing it all off. 2| It’s packed full of fresh vibrant flavors that make it an ideal side dish or salad year round. But it’s especially delicious in summer when those juicy little cherry tomatoes are in peak season. 3| And finally, it can really stand up to the heat. When potato salads and macaroni salads filled with mayo are starting to appear a little suspect, this refreshing orzo salad is still hanging tough. Don’t be surprised when you see guests heading back for seconds… and then even thirds. It’s THAT good! I certainly wouldn’t count on having any leftovers to take home. 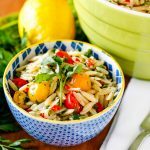 This lemony basil orzo salad is perfect this time of year. It highlights all of the great summery flavors that you can buy fresh right now — gorgeous red and yellow cherry tomatoes, bright parsley, and vibrant basil, along with a healthy dose of fresh lemon zest and juice. It the type of summer salad that only gets better as the flavors marry together while it chills. So it’s the perfect side to make earlier in the day for an evening gathering. Not familiar with orzo? It looks very similar to rice, but it’s actually a rice-shaped pasta. Orzo means “barley” in Italian, referring to the small, barley-like shape. I’ve tried several kinds of orzo, and I always come back to the DeLallo brand. I can count on it to cook up perfectly al dente, without a trace of the mushiness I’ve found with some other brands. Kroger and Walmart carry it around here, and I always grab several packages when I see it on sale to keep on hand. Speaking of cooking orzo pasta, I always follow the cooking instructions from the DeLallo package, which I’ve outlined in the recipe directions. I know a quarter cup of salt sounds like a ton, but it gives the orzo massive flavor, and most of the salt stays behind in the water. When you use this method, you really shouldn’t have to add much additional seasoning to the finished orzo pasta salad. While I adore this orzo salad as is, you can also add a 4-oz. container of crumbled feta cheese for more of a Mediterranean orzo salad. Or even turn it into a main dish by adding some sliced grilled chicken breast on top, which would also make this a fabulous meal prep recipe. Either way, just make it ASAP — I promise you won’t be sorry you did! PIN IT NOW! 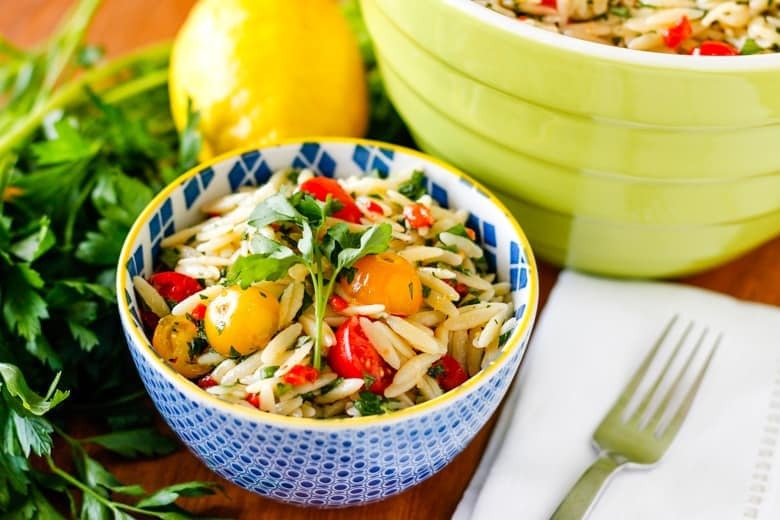 CLICK HERE TO ADD THIS LEMONY BASIL ORZO SALAD RECIPE TO YOUR EASY RECIPES BOARD ON PINTEREST! Bring 5 quarts of water to a rolling boil and add 1/4 cup salt. Add the orzo pasta to the water and stir. Bring the water back up to a boil. Stirring occasionally, cook for 9 minutes. 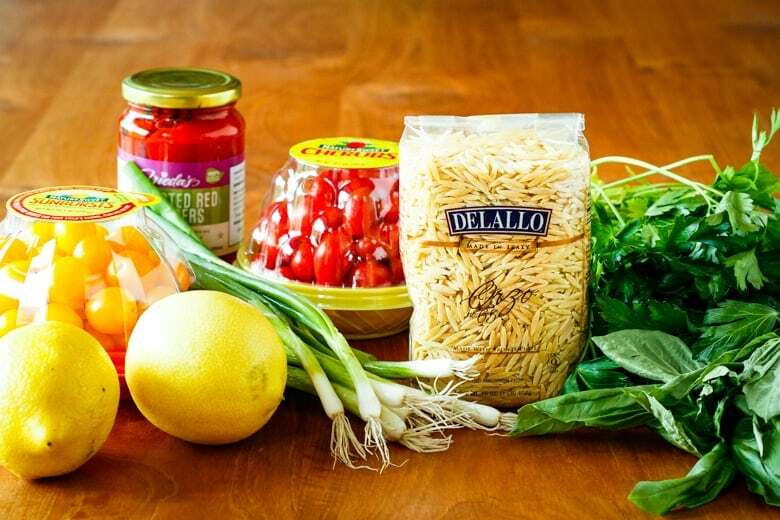 While the orzo is cooking, zest and juice the lemons into a large mixing bowl, and whisk in the olive oil. When the orzo is done cooking, drain it (do not rinse), and toss it with the dressing while still hot. Allow the pasta and dressing to cool while you chop the rest of the ingredients. Fold in the red peppers, grape tomatoes, green onions, parsley and basil. Refrigerate for at least two hours. Serve cold. If you love orzo salad recipes, I think you’ll also adore this Greek orzo salad! Dressed in the same lemony vinaigrette, it’s filled with cherry tomatoes, roasted red peppers, cucumber, feta cheese, and Kalamata olives with a punch of fresh parsley and mint. I’d love to see how your orzo salad turns out… Tag me @Unsophisticook on Instagram or use the hashtag #Unsophisticook so I can check it out. Enjoy! I’m making this for our Teacher “Salad” Luncheon and wondered if you can prepare the night before? Just worried that it might get soggy. Thanks! Oh, how fun! You can definitely prepare this orzo salad the night before. If you decide to add feta cheese, like I mentioned in the post, I would probably wait and stir that in the next morning before you leave. But everything else will still be delicious! This was crazy delicious! Next time I’ll make double so I can keep some for myself! It was gone in a flash! Thank you for sharing! Thanks for coming back to share a review, Dominique — so glad to hear you enjoyed it! I’m SO happy to hear how much you love it, Megan! And I think your comments on the salt are spot on. It sounds like a ton, but when you use the proper amount of salt and water, it really just flavors the pasta perfectly — and the majority of the salt stays in the water. Thanks so much for weighing in! This Pasta Salad…… I made it once, and we were hooked! My kids ask for this salad at least once a week! So happy to hear that! It’s a fave here, too — and it’s usually gone the first day I make it. Will have to try this version. I make mine by roasting 9 bell peppers red, orange and yellow that I toss with fresh minced garlic Olive oil salt and pepper and instead of parsley and basil I use fresh mint leaves and add feta cheese. Gives it a great taste. What a fresh, delicious summer salad! I reduced the salt to 1 Tbsp but otherwise made as is. Took it to a group event and everyone else loved it, too. New favorite for sure! So glad you loved it, Suzi! I know that salt sounds like a lot, but it’s actually what DeLallo recommends on the orzo pasta package. Most of it stays in the water, and you won’t need to season the salad much (if at all) after cooking. I’m a pasta salad lover, and I absolutely have to try this one. It looks SO good! That recipes looks so bright and light! But I really love the bowls in the photo. So Cheery!